If you’ve watched one of the World Cup football matches that just ended in Russia with France’s second victory, you’ve surely seen ads by giants such as Adidas, Visa, and Coca-Cola, which were alongside lesser-known companies such as Mengniu, Vivo and Wanda. These companies don’t sell sporting goods, especially not football equipment, but rather specialize in selling groceries, cell phones and setting up enormous movie complexes. These three companies come from a country that has never made a mark in any edition of the World Cup, furthermore they didn’t even qualify among the 32 countries that took part in the 2018 World Cup, but present themselves as the future of football: China. The Chinese team only qualified once for the final phases of the World Cup. 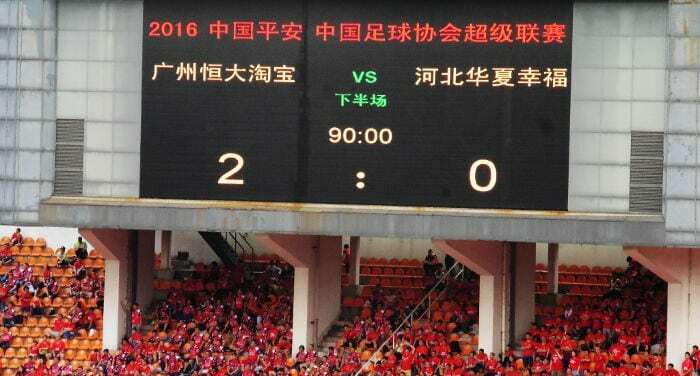 It was 2002 and China played three matches in the qualification phase without scoring a single goal and was eliminated with zero points. The only positive note was the 4-0 defeat to Brazil’s Roberto Carlos, Rivaldo, Ronaldinho and Ronaldo. Setting aside the unexpected qualification for the final phases, China participated in the competition between 1930 and 1954 and between 1962 and 1978; they didn’t qualify for the final stages in 1958, from 1982 to 1998 and from 2006 to today. In the World Cup Asia qualifications in 2018, the Chinese national team didn’t manage to reach the playoffs in a group headed by Iran, and placed fifth, behind teams such as the devastated Syria, whose team was forced to play their home matches abroad. The following article is a first introduction to the world of Chinese football. We’ll try to understand where this passion for football comes from, where the money comes from that has allowed Chinese magnates to buy some of the most important football clubs of worldwide fame, what are Xi Jinping’s dreams for the Chinese national team and the limits that have kept them from qualifying the latest World Cup edition. The plan to relaunch football in China is clearly supported by two essential elements: the government and private funds. Now they have to concentrate on a wise use of managerial know-how by hiring foreign personnel and creating an actual football academy throughout China. Before Beijing published Document N.46, which has made the sport a fundamental element of Chinese economic development, football wasn’t even considered in the government’s plans. With the support of major private and public investors, the objective is to build a league that is able to attract and churn out talent on an international level so as to get into the next World Cup. In 2011, in an attempt to resurrect the luck of the Chinese national team, the then vice president Xi Jinping confessed to having three dreams in the field of football: participate again in the final phases of the World Cup, host one of the next rounds of the World Cup and win one by 2050. Considering the success of the Summer Olympics in 2008 and the preparations for the Winter Olympics which will be held in China in February 2022, no doubt Beijing will wind up hosting a World Cup in the not too distant future, having showed the whole world their ability to organize and run a sporting event of that scale. Hosting a World Cup will allow President Xi to reach two out of three of his football goals, since China would automatically qualify as the host nation. And what about Xi’s third dream? Now it gets more complicated. Although it’s true that host nations have the best chances to raise the trophy, there’s no denying the football superiority of the European and South American teams. Another problem in reaching Xi’s dream is that the magnates that control the main football clubs that take part in the Chinese Super League (CSL) are motivated solely for profit. In fact, to further attract the public, which would otherwise be exclusively interested in following foreign champions, the major Chinese club owners sign monstrous contracts with European and South American talent, and don’t invest in the search and growth of local athletes. Thanks to the efforts of the Chinese Football Association (CFA), the cost of acquiring foreign players drastically dropped starting in January 2018. With the enactment of a tax equal to 100% of the price tag for a single foreign player, numerous losing Chinese football clubs have preferred to concentrate on local talent rather than get further into debt. In addition to this tax, the CFA obligates every Chinese team who chooses foreign players to field an equivalent number of Chinese nationals under the age of 23 at the same time. Mads Davidsen, technical director from Shanghai SIPG has another view, which is in favor of bringing in foreign stars to the CSL. In fact, according to Davidsen, “when a foreign top player arrives, the level of the whole team increases. If the player in question has a positive attitude and is a leader, it has a positive effect on their teammates and brings greater grit to their training. This helps the team to grow, and in the long term, this will be a winning strategy”. With a population of over 1.3 billion people, China still struggles to create a winning football team. The role of the Chinese when it comes to football for now is limited just to being spectators. According to an article in the Huffington Post, football is the most followed sport in China, with single matches of the English Premier League regularly reaching an audience of more than 320 million. Consider that in 2015, the average attendance for every match played in the Chinese Super League (CSL) was about 21.800 paying spectators, the highest average in Asia. Since the 18th edition of the World Cup was officially inaugurated in Moscow last June 14th, in all the bars and restaurants in China hundreds of thousands of fans stayed standing until late at night united by a common passion: football. You can say that in recent years, following the lead of the politicians in Beijing, a real passion for the sport was born. According to the most recent data, over 100 thousand Chinese tourists traveled to Russia during the World Cup, compared to just 10 thousand English spectators. If you think that in 2002, when China participated in the World Cup shared between South Korea and Japan, the number of Chinese tourists visiting those two countries surpassed 50 million, the increase in interest in football is even more evident. Not to be forgotten in the growing number of Chinese tourists going to Russia is the bettering of relations between these two countries, which was recently defined as “a historic best”, especially following the recent deals signed between the two powers, as well as the renewed importance of the Shanghai Cooperation Organization (SCO) and the ideological alignment between Moscow and Beijing in a time when Western meddling is increasing. According to some data released by Ctrip, the Chinese giant in the tourism sector that bought the well-known Skyscanner in 2016, the Chinese tourist spent on average 7,500 Dollars to go to Russia during the World Cup. Those who couldn’t afford the luxury to see the World Cup in person, could still enjoy the matches thanks to a streaming service offered by the TV station CCTV, together with other providers such as Youku and Migu. Football has become so popular in China that during the World Cup of 2014, the concept of a “football widow” became widespread, a reference to the women whose husbands stayed standing all night to watch the ball game. What’s hidden behind this passion for football? Beijing’s plans for bringing the Chinese national team to the final eight and to be awarded one or more World Cups are no secret. In recent years President Xi has repeated his desire to relaunch the image of Chinese football on a global level, following the three fundamental steps discussed above, namely to host the World Cup, qualify for the competition and win by 2050. That last objective is practically unreachable if you consider that the men’s team is ranked 75th, preceded by countries like Syria and El Salvador. The emergence of Chinese industrial giants as major sponsors of the World Cup is a sign of a deep internal push to support the football industry, both by a double crisis tied to corruption scandals that struck the football world and joined by both the host country, Russia, and organizing body, the French Fédération Internationale de Football Association, better known as FIFA. The latter is still weighed down by corruption scandals that forced the historic president Sepp Blatter to give up his position in 2015 and brought about the accusation of more than 30 figures tied to the world of global football. Russia’s international image, instead, was strongly weakened by a series of serious diplomatic issues, such as the poisoning of a Russian ex-spy and his daughter on foreign soil, war crimes in Syria and the Ukraine, as well as the influence exercised in Western political elections. The earnings from sponsors make up the main source of FIFA’s revenue (in the World Cup played in Brazil in 2014, FIFA took in a total of 4.8 billion dollars, 1.58 billion dollars coming from sponsors), according to some television ads. Nevertheless, corruption scandals and the association of the FIFA brand in Russia as the hosting country put off historical sponsors, such as Sony, Johnson & Johnson and Castrol. If in 2014, a little more than 6 months from the beginning of the World Cup in Brazil, all the available spots for sponsors were already filled, this year the soccer organization barely managed to get 12 partners. In this sense the participation of the large Chinese conglomerates and their investment of hundreds of millions of dollars for an advertising spot during the matches represented a real salvation to the competition. The empty spaces left by Western sponsors was quickly filled by these large Chinese private companies, guided by a strong capitalistic and entrepreneurial mentality. Foremost is Wanda, which operates in the hotel, real estate, tourism and culture sector, whose president, Wang Jianlin, is the fourth richest man in China. With a partnership signed with FIFA for 150 million dollars, Wanda opened the way for numerous other Chinese conglomerates, like Vivo (cell phones), Mengniu (dairy products), Hisense (household appliances) and Yadea (electric scooters). Beyond the enormous profits coming from the internationalization of Chinese brands, not to be forgotten is the function served by raising awareness of international public opinion of China’s role as a global power. The spread of Chinese brands is to be considered another aspect of the much discussed Chinese “soft power”, often associated with institutions such as the Confucius Institute, which has helped thousands of students throughout the world to come into contact with China’s ancient culture for the first time. From a purely political point of view, China has passed on to the so-called “stadium diplomacy”, described as how Beijing has worked to build stadiums in Africa and Latin America in exchange for diplomatic support and access to energy resources, with the goal of winning the World Cup to attract ever more international acclaim and to relaunch their country’s image to compete on every front. Thanks to a partnership with FIFA, Chinese companies that were up until recently unknown outside the national borders have earned the opportunity to attract a growing international public and distance themselves ever more from their domestic competitors. These partnerships are also useful for favoring China as a host country in 2030, as the second part of President Xi’s plan to have China win by 2050. According to Liu Dongfeng, economics and management professor at the Shanghai University of Sport, Xi Jinping sees football as an integral part of transforming China into a world power. “Football is his way of making China great again”, the professor says, and the Chinese team has the obligation to “represent China’s position on a global level”. The online newspaper then asks about the objectives of these partnerships and the sense of linking your name to an event that only happens every 4 years. Obviously the answers will be seen in the years to come. Mark Dixon from ThinkingLinking, suggests a possible strategy for the large Chinese private entrepreneurs to lead China toward winning the Cup: buying numerous small foreign clubs, rather than spending huge sums to get bigger clubs like AC Milan, Inter, Manchester City and West Bromwich Albion. The transfer of managerial know-how is what will make the difference between success and defeat. Spending the next 2 billion Euros to buy 100 clubs valued at 20 million Euros apiece, rather than just 20 clubs for 100 million Euros is the best way for an effective transfer of Best Practices on how to launch, run and grow a club. Buying a legacy club has a large media effect, but the osmosis between a series of small realities and Chinese clubs is like planting 100 seeds in fertile soil. Moving from the domestic plan, it’s important to start our analysis of the current football revolution in China by starting with the plan introduced by Xi Jinping in 2015. The plan, divided into 50 points, establishes from the start the net separation between the Chinese Football Association of the General Administration of Sport directly controlled by the government in Beijing, making it the only sporting association among the 72 in China that’s almost completely free from central control. The plan also sets the objective of opening 50 thousand football schools by 2025, inserting football as part of the curriculum in the numerous schools spread throughout China. The number of football fields in total will go from the 11 thousand existing ones in 2015 to over 70 thousand in 2020, allowing for the equivalent growth of 50 million football players, of which 30 million are just students. President Xi also created an actual task force, equal to other active task forces in the economic, information security and military sectors, to promote football playing at the highest levels. China, following the line traced by the Olympic Games played in Beijing in 2008, is motivated by the need to gain international recognition in sports, and the only way to make this dream come true is to create an actual football culture from the ground up. Beijing will have to reduce political interference in sports, support the transition from an academic mentality centered on punishment to the recognition of value and creativity that comes from a wider participation in extracurricular activities, such as football. Within the majority of Chinese nuclear families, football is still perceived as a distraction from scholastic life, and as a result young ones are often discouraged from undertaking a career that isn’t in line with that vision. They’ll also have to concentrate on creating domestic football role models and not just acquiring foreign players. In fact, when we think of Yao Ming, the Chinese basketball star who played in the NBA for years, we realize the important role he had in influencing younger generations. Yao Ming debunked the myth among Chinese youth that they couldn’t be competitive in a sport with a “large ball”, but only in ones with a “little ball”, like table tennis. Having a Chinese idol to follow could be the key to encourage more kids to practice football. The Evergrande International Football School: a model for building the future Chinese national team? Winning a World Cup will mean going through a constant growth of football nurseries in China and the birth of a real football culture among the youngest. Fernando Sanchez Cipitria, technical director of the Evergrande International Football School located in the Chinese province of Guangdong, has the objective of growing talent among the little ones who will someday be the future of Chinese football. This football school, started as the academy of the most famous team, Guangzhou Evergrande, opened in 2012 and is part of Beijing’s dream to transform China into a giant of the football world. The school is the creation of Xu Jiayin, owner of Guangzhou Evergrande, who invested 130 million Euro to make it happen. His dream is to revolutionize Chinese football, and to motivate aspiring football players, he erected a giant replica of the World Cup in front of the entrance of the school and made the Square of Stars, where they’ve placed statues of Pelé and Bobby Moore. It’s an impressive project: 50 football fields, an open-air Olympic sized pool, a supermarket, a cinema, a stadium and housing for more than 500 full-time workers. The purpose is to gather 10 thousand aspiring football players, whose dreams of glory have found lifeblood in the acquisition of 50% of the Guangzhou club by Jack Ma, founder and president of one of the biggest online commerce companies, the Alibaba Group. It won’t be easy to transform these kids into champions, and a fundamental step will be their growth in foreign clubs. According to Roger Schmidt, ex-technician of Bayer Leverkusen and now on the bench for Beijing Guoan, “Chinese players want to get better and have what it takes to reach important goals”. Schmidt adds that “Chinese football has made enormous progress, but the road is still long, especially without an important football tradition as in Europe and South America”. “The Chinese people have demonstrated themselves to be able to do great things in the world of marketing and business, and they’ll equally be able to achieve the same results when it comes to football”. Although quite ambitious and difficult to achieve, Xi’s dreams can come true only by following a slow and progressive investment in local talent, maintaining a constant but controlled flow of foreign football stars to the Chinese league, so as to make them more international and attractive. The Chinese entrepreneurial mentality should concentrate on their long term objectives rather than the short term ones, which have many times shown themselves to be a gamble and counterproductive both economically and finacially. Alessandro lives in Beijing, where he's attending a Master in International Relationss at Peking University. Previously, he studied Asian Languages, Culture and Society at Ca' Foscari University (in Venice) and Chinese Mandarin at the School of Oriental and African Studies (SOAS), in London.